Non-enveloped, rod of filaments of 7nm in diameter and 700 to 2000nm in length. Helical capsid with adsorption proteins on one end. 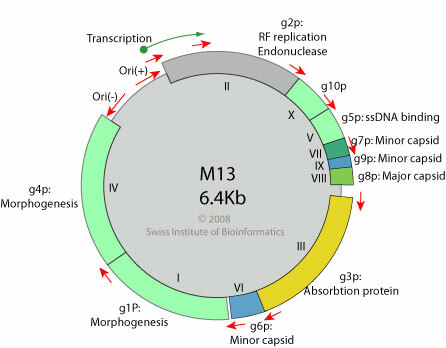 Circular, ssDNA genome (+) of 4.5 to 8kb encoding for 4 to 10 proteins. Replication occurs via dsDNA intermediate and rolling circle. Viral g3p protein mediates pilus-mediated adsorption of the virus onto host cell. 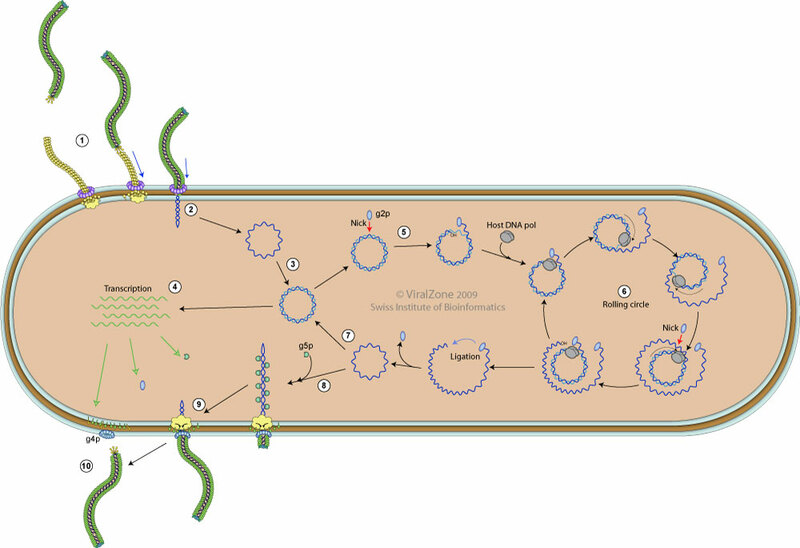 Pilus retraction pulls the virion to the host internal membrane. Viral g2p protein nicks RF DNA strand at the origin of replication. When enough g5p protein is synthesized, conversion into RF dsDNA is inhibited, as neo-synthesized genomic ssDNA is covered with g5p. g5p are replaced by g8p proteins to trigger the assembly of the viral capsid. The proteins of the capsid mediate the Injection of the viral DNA through bacterial membranes into cell cytoplasm.